What are the characteristics of content that get the most backlinks? What can we learn from content that has managed to get a significant amount of backlinks? To answer these questions, we analyzed over 10,000 highly linked articles. We found our list of articles by using BuzzSumo to search for all articles created in the past year that have over 50 linking domains in ten various niches (marketing, travel, beauty, pets, finance, business, dating, health, technology, and fitness). We also used Moz to analyze the Domain Authority (a measure of the backlink profile and ranking power) of the domain that the content was on. The first thing we want to point out is how rare it is for content to get 50 links and appear on our list at all. We recorded 4,396 articles with 50-99 linking domains, but we searched over 100,000 articles across the various niches. All of the 10,000 articles in this list are quite successful. We want to show how some articles manage to stand out, even in this list of top-notch content. When we grouped the content by number of links, we saw that each 100-link group had fewer members than the last. 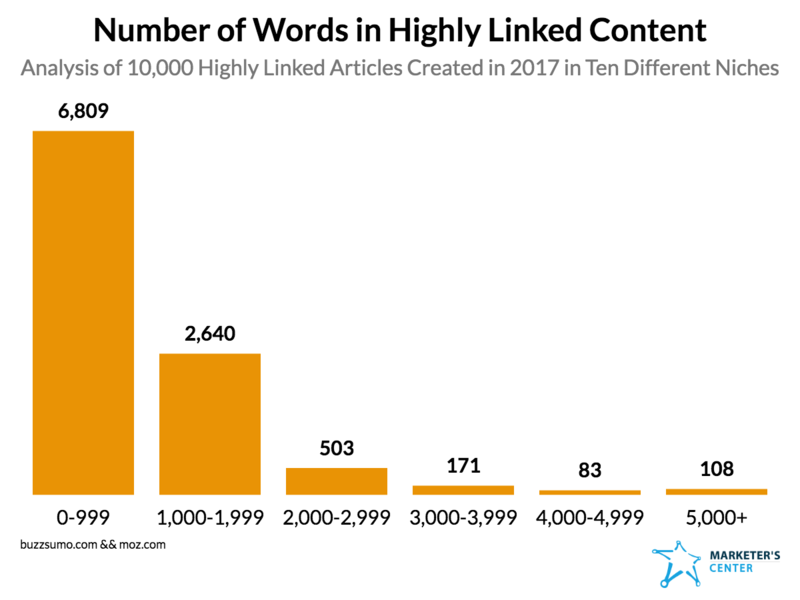 Over 70% of highly linked content has less than 200 links. This shows how incredibly unlikely it is for an article to get a link from more than 200 domains. When building links to one of your pieces of content, fifty links seems to be a solid target to hit. Getting more than that could likely be a matter of chance. BuzzSumo can determine whether content belongs to one of several types of template: list post, how-to article, why post, what post, video, and infographic. This makes sense since highly linked content needs to be unique. If a piece of content is similar to lots of other content, why would anyone link to it? 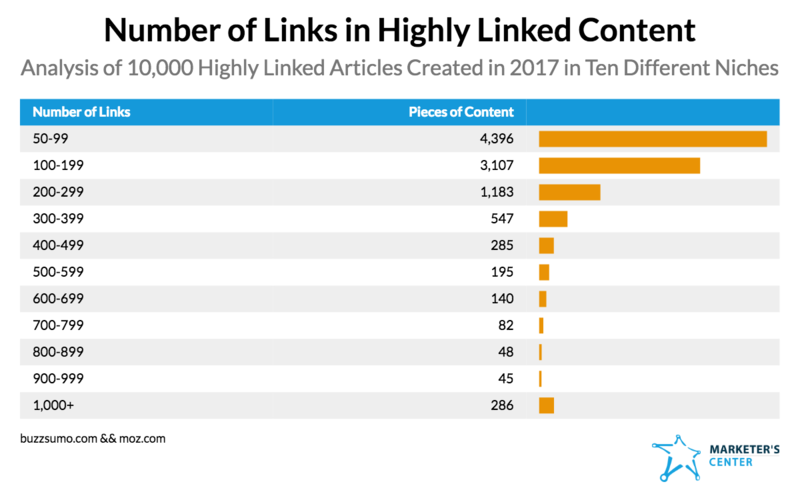 SEO and link building has become quite competitive in 2018. You need to create content that stands out if you are going to convince people to link to you. Taking the time to create content that is a cut above anything else out there is practically a requirement for linkworthy content. 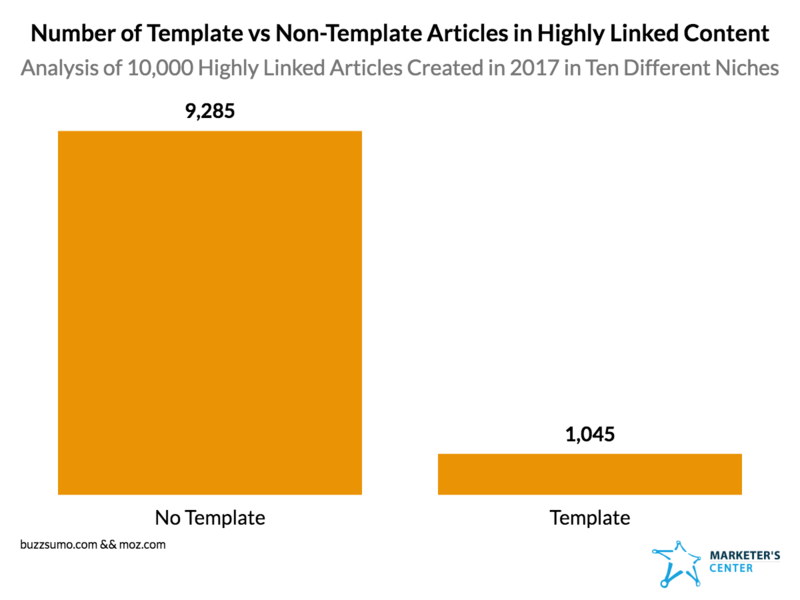 When we looked at the highly linked articles that did use a template, we saw that list posts and how-to articles were the most common. Less than 1% of highly linked content contained a video or an infographic. This doesn’t mean that you can’t build links to videos or infographics. It just means that it’s highly unlikely that your video or infographic will get 50 or more links. Also, we’re not suggesting that you should or shouldn’t use list posts or how-to articles for link building. We just want you to keep your expectations realistic for you list posts and how-to articles. We saw that the most titles of highly linked content contained 41-80 characters. This makes sense since a title needs to be around 70 characters or less to fully display on Google. There were some notable exceptions. Over 10% of titles contained more than 80 characters. Less than 10% of titles contained less than 40 characters. This shows that keeping your titles around 70 characters long is a good idea, but there are times when an extremely long title makes sense. Other times, a short 20 character title makes sense. 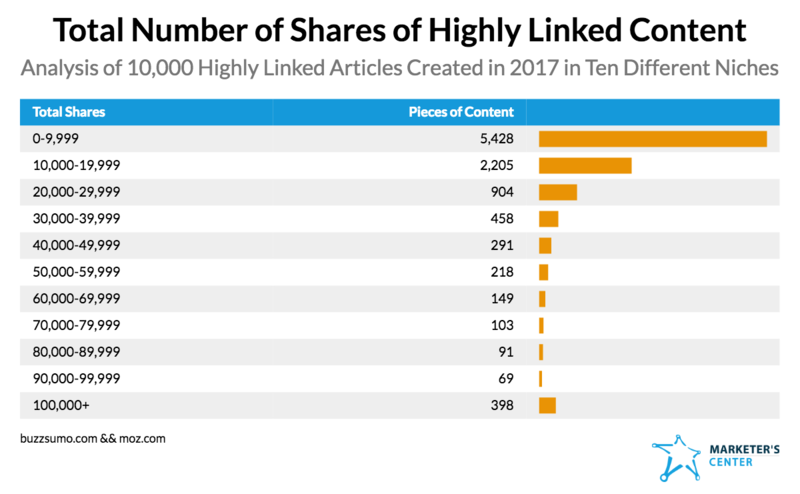 We analyzed how many shares that highly linked content received. 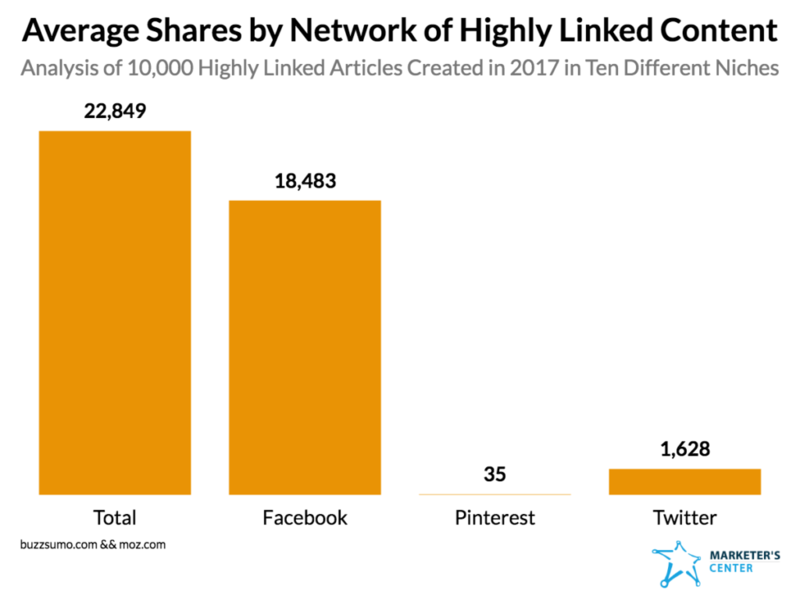 We found that a majority of highly linked content received less than 10,000 shares. Our research shows that content that goes viral and content that gets a lot of links are not usually the same. 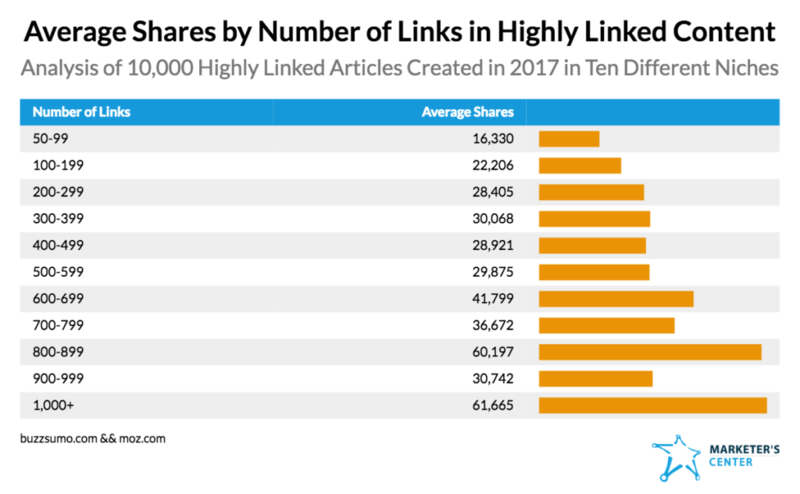 Highly linked content does get many more shares than average content (research from BuzzSumo says that the median article gets four shares). But, it shows how unlikely it is for highly linked content to go viral. This suggests that you should optimize content for sharing or building links, but not for both. We further explored the relationship between shares and links by trying to discover a relationship between links and number of shares. We saw no correlation between the number of shares and the number of links an article receives. You might expect that the more links a piece of content has, the more traffic will land on the piece, resulting in more shares. Our best explanation for the lack of correlation between shares and links is because shares and links have to appeal to different audiences. Link building content must appeal to bloggers, journalists, and webmasters who have the ability to link out to articles. Content that gets a lot of shares must appeal to the general public and motivate regular people to share with their personal network. This reinforces that it’s important to focus content on either link building or generating shares. Highly linked content gets shared on Facebook far more than any other social network. The content we analyzed was shared ten times more on Facebook than on Twitter. Pinterest was basically a rounding error. This shows that if you’re trying to get more social activity on content that you’re building links to, you should probably focus on Facebook. Our best guess for why Facebook gets more engagement is because most Twitter users don’t have a significant amount of followers. If they tweet something, no one will notice. However, most Facebook users have some amount of family and friends that will follow what they say. If they share something on Facebook, they’ll get some type of response back. 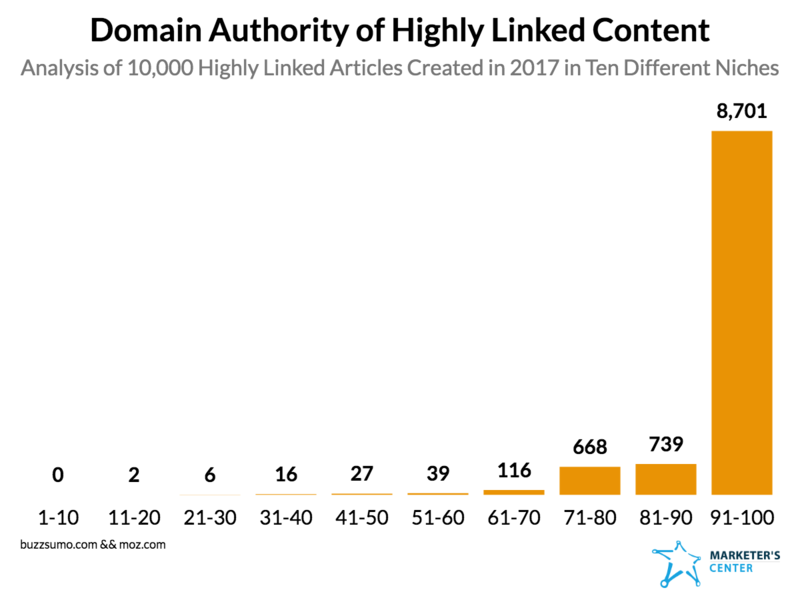 When we analyzed the Domain Authority of the sites which hosted highly linked content, we saw that the vast majority had a Domain Authority of 90 or higher. This makes sense since high Domain Authority is a result of a high amount of links. Highly linked sites have more traffic and, therefore, a higher chance of attracting backlinks. Keep in mind that very few sites have a Domain Authority of 90 or more. As a point of reference, the popular SEO news site Search Engine Land has a Domain Authority of 89. If you’re building links to content on your own site, then you have to have realistic expectations. You don’t have the Domain Authority or traffic of the bigger sites, so it’s going to be harder for you to create content that gets 50 linking domains. 20 or 30 links to a single piece of content may be more realistic. It’s definitely possible for you to create content that gets 50 links when posting on a low Domain Authority site (we saw examples of it), but it’s extremely unlikely. There is a strong trend around wanting to create content that has more words. Articles with more words are thought to have a better chance of ranking in Google. 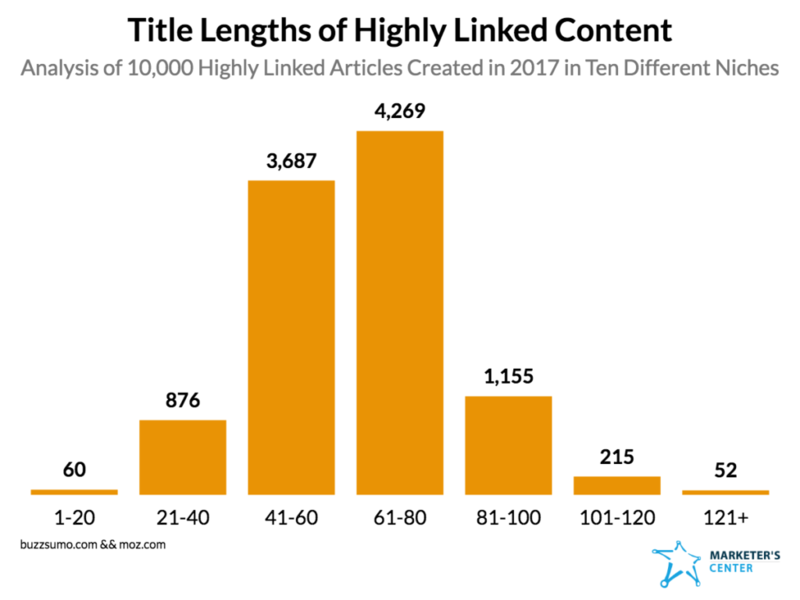 Our research shows that longer content is not necessary for building backlinks. It’s cliche, but quality is better than quantity. A well-written 800-word article can receive more than enough backlinks. This doesn’t mean that longer content with over 3,000 words can’t attract backlinks. We saw plenty of longer articles that received lots of backlinks. It’s just that it’s not necessary. Make your content as compact as possible without worrying too much about word counts. Your best bet is not to use a well-known template like a how-to post or a list post. Highly linked content needs to stand out. Have realistic expectations about how many links you can build to your content. If you’re not posting on a well-known site, then it’s unlikely for you to build more than 50 links to a single piece of content. It’s advisable to keep your titles around 70 characters long, but you can still have plenty of success with longer or shorter titles. Quality is much more important than quantity when determining content length. Create content for links or create content for shares. It’s unlikely that you’ll create content that can do both. Link building is hard to do right. That’s why the majority of content gets zero backlinks, according to research from BuzzSumo. Still, it is possible with great content and proper outreach to build a significant amount of quality links. We hope that our research will help you and wish you the best of luck in your link building efforts.